I used to love perfume counters and stores like Bath & Body Works. Now I run the other way when I see someone handing out perfume samples and hold my breath when I walk by Abercrombie & Fitch. Instead of a pleasant scent, all I smell are toxic chemicals. 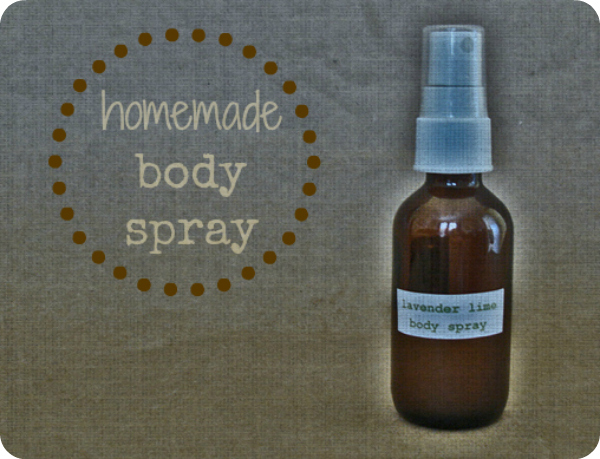 So today I'm going to show you how to make a super simple all-natural body spray with essential oils. Unlike fragrance oils, essential oils are natural compounds extracted from parts of plants, flowers, and trees and have been used throughout history for their medicinal and therapeutic benefits. Not only will you save money by making your own body spray, you will know exactly what's being absorbed into your skin and inhaled into your lungs. 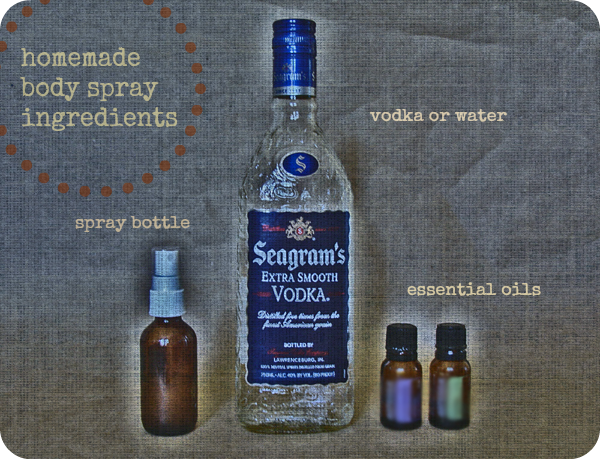 Add vodka or water to the spray bottle. If you use water, you'll need to shake really well before each use because essential oils do not dissolve in water. I bought my 1 oz. glass spray bottle at Sprouts, a health food store, for about $2-3. But you can also find them online. Add essential oils of your choice. I used Mountain Rose Herbs' information pages for specific essential oils to figure out which essential oils blend well together. You can also check out Introduction to Aromatherapy Blending for more helpful info. I had so much fun creating the following body spray recipes! I don't like any of these essential oils when used alone for a body spray, but once combined they make an amazing scent. I will definitely be creating more recipes and adding them to this list! **I love citrus oils, but some of them cause photosensitivity, meaning when they are left on skin and exposed to sunlight, they can cause the sun's effect to be greatly magnified. So I use these body sprays on my clothing or on skin that isn't going to be exposed to the sun. You can find essential oils at your local health food store, Amazon, and Mountain Rose Herbs. Here are more ways to use essential oils. Learn more about essential oil safety. Do you have a homemade body spray recipe to share? What essential oil scents do you love when combined? My personal favorite scent so far is lavender lemon with the tiniest hint of rosemary. I make bath salts and body spray with that combination. Thanks for sharing! I can't wait to try! Great post, Kendra! Funny timing - I was just at the store buying supplies to make something similar to write about and saw your post! I'll have to mention you for more options for recipes. What a great and easy way to provide one of life's little pleasures. They'd make great gifts too! What an excellent idea! I, too, run almost screaming from those perfume spraying women at the mall due to all of the toxins. When my college-aged daughter comes home, she grumps because I won't let her douse herself in the cloud of body spray she's used to using. My allergies can't handle it! Think I'll make up a batch of this for her -- something sweet, like maybe orange blossom and vanilla? I love making my own scents too! I like to combine lavender and orange and spray it on my pillow for a Sleepy Time Spray. I'll have to try the Grapefruit/Bergamot combination--sounds delicious! This blog always surprise me with new home made products. I never thought I will be able to make body spray at home. Ah Homemade body spray sounds interesting. I will give my feed back after try this out. I love the products made out of natural ingredients than chemical products, but I don’t like to use homemade products because we have no way to ensure the quality of such products. So I feel little risky about those homemade products. You ensure the quality of homemade products by ... making them at home. other sites seem to more or less concur with this thinking. Could you use Witch hazel instead of Vodka? I made something like this. I put ginger, vanilla, and sweet orange in it. It is so refreshing, especially in the summer!